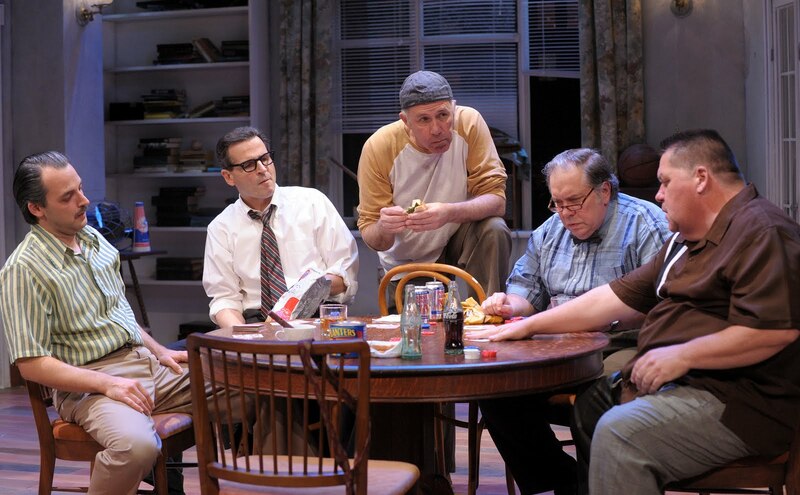 So here’s the thing – I did not particularly enjoy Theater J’s production of The Odd Couple. BUT, what you need to know is that my lack of enjoyment stems completely from my personal preferences about theatre and not due to any fault in the cast or crew. On the contrary, I can recognize that this is a superbly directed and acted production. I can pretty much guarantee that every person in the world would like this production more than I did, but that’s simply because Neil Simon’s humor is too innocent, the set up too formulaic for me. When the rest of the audience guffawed, I merely cracked a smile. That being said, I must tell you that this production does everything right. There is an emotional grounding to Neil Simon’s characters that all too often gets lost. After all, what do people remember about The Odd Couple? That a sloppy guy and a neat freak become roommates and comedy ensues. But Felix and Oscar, in addition to being the source of a laugh a page, are also men in pain. They are divorced, middle-aged, and trying to navigate a world without their wives and without their families. And when this aspect gets lost, it is when Neil Simon becomes unbearable. Photo by Stan Barouh. Marcus Kyd, Paul Morella, Rick Foucheux, Michael Willis and Delaney Williams. Director Jerry Whiddon brings the play off with a remarkably retrained air. Nothing can kill Neil Simon faster than for the actors to knowingly play the jokes, and this trap is avoided at every moment; the actors are always real. You couldn’t ask for better casting than Rick Foucheux as the sloppy and deadpan Oscar and J. Fred Shiffman as the neurotic and nervous Felix Ungar. The cast is top notch all around, and Marcus Kyd in particular gives a find showing as the duo’s irritable poker buddy, Speed. Kyd has a remarkably refined comic sensibility – he knows when to push and how far, and when to step back.